Cleaning your kitchen can be a complex task to perform if you don’t have essential cleaning tools. Kitchen requires a different approach and cleaning tools for cleaning various things like kitchen floors, utensils, oven, washing machine, refrigerator, exhaust fans, window etc. Due to everyday activities in the kitchen, makes the place dirty, so it is necessary to keep the kitchen room clean and tidy. 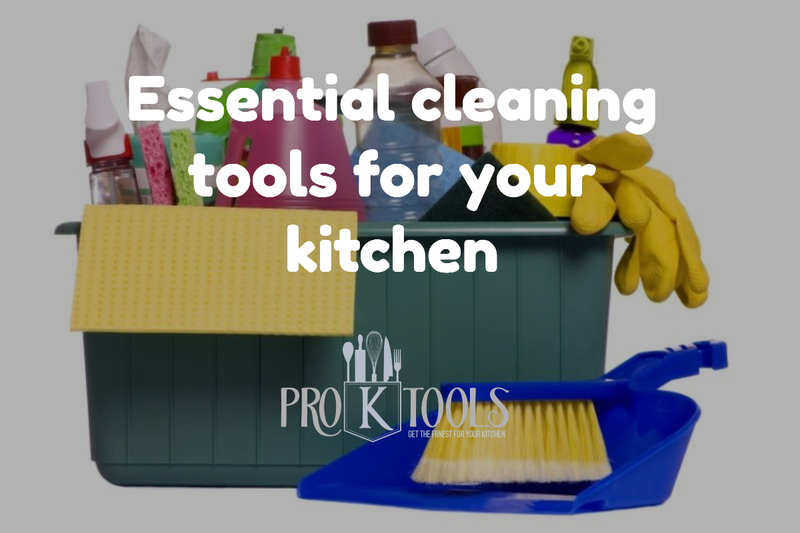 Here are some essential cleaning tools and supplies that will help you to keep your kitchen clean and all the things in good shape. All-purpose cleaner is an important cleaning product that needs to be present in your kitchen cleaning tools. It’s all in the name, the main benefit of the all-purpose cleaner is that it offers amazing results on various surfaces. It works great on countertops present in the kitchen. They are mainly used to wipe down any tough surface in the kitchen like dust and build-up, countertops, dining tables, kitchen sink and for general touch-ups. All-purpose cleaners are available in both spray and concentrated solution version. Some of the cleaners are well suited for killing germs, bacteria, viruses and help in deep cleaning in the kitchen. An everyday task in the kitchen can make your kitchen ceilings to get trapped with dust and dirt, this can increase the chances of allergies. So to clean the trapped dust, you require step-stool ladder unless you are very tall. An extension dusting kit makes your task easier to clean the dust and eliminates the use of ladder and stool. You can just shake it outdoors or rinse it to eliminate the dust out of your kitchen. A Vacuum Cleaner is an important and useful tool not only for the kitchen but also for the entire home. You can pick the majority of the dust and dirt accumulated in your kitchen, bedroom or in the living room. You can also use a handheld vacuum cleaner for efficient cleaning. Vacuuming the kitchen regularly can help you to avoid dust allergy and difficulty in breathing caused due to dust particles. Microfiber Cloths are available in different colors and material. You can use this microfiber cloth for cleaning kitchen countertops and appliances. They work brilliantly on your electronic appliances in the kitchen like Oven, refrigerator, toaster etc. Microfiber cloths are really effective while picking dust, holding grime, liquid, and leftovers in the kitchen. They are made of thin fibers that are much finer than cotton ones. It almost removes bacteria on surfaces and it also saves money, outwears other cleaning cloths. For the Kitchen, Disinfectants are best which are made to destroy the viruses and germs like fungi and bacteria. It also helps to prevent the growth of various micro-organisms. Always have a disinfectant in your kitchen for tackling surfaces you have cut meat on, so cleaning the surfaces with disinfectant prevents illness among the family and reduces the risk of contracting any infections and viruses. As we know that our skin is meant to be soft, smooth and delicate. Many of them are in such a hurry to finish the utensil cleaning and other works that they don’t consider the impact of harsh chemicals on the skin. The use of rubber gloves acts as a barrier between your hands and cleaning work. The rubber gloves prevent you from nasty infections, increases grip on items, provides a pleasant experience while washing dishes and cleaning. A scrub brush or a scrubber is mainly used to clean dishes. It is actually a type of wide brush that comes with a long shaft used for removing stains and cleaning hard floors. It is also used on tough cleaning jobs in the kitchen like washing the countertops and gritty floors. A scrub brush has hard bristles compare to a broom that comes with a soft brush. Paper towels are commonly used to clean up spills and wiping down oil and food remnant. You can also use a moist paper towel to clean vegetables and fruits to remove all dirt without logging of water and wrecking their flavor. Basically, it acts as a filter and can help you to wash berries, mushrooms, grapes. You can also use to clean the stovetops, oven without scratching up the surface. It is necessary to have some generic cleaning cloths in your kitchen kit. They are really handy and can be used along with the multi-purpose cleaner or with disinfectants for wiping down appliances, kitchen countertops, wash basin etc. You can stock up cleaning accessories and supplies in wholesale quantity so that you can have it in your kitchen tool kit and can be used at any time needed. The hand-held squeegee is used in the kitchen to clean hard and insanitary elements on kitchen floors. It is also used to remove cleaning fluid and water from flat surfaces like kitchen countertops, glass surface, tiles floor. After some initial mopping, you can use water with cleaning liquid on the cleaning area, then use a squeegee to peel off the dirt and grime from the area. A squeegee is a tool that helps you a lot in cleaning and can do things that a mop cannot. A sponge is a basic tool used mostly in the kitchen. It is made of soft and porous material, typically used for cleaning impermeable surfaces. Sponges are good at absorbing water, cleaning liquid and other water-based solutions. You can use it for cleaning utensils and your fry pans to remove oily stains and greasy things. They are available in various types like a dry sponge, abrasive sponge, cellulose sponge and more for different materials.